People walk past a fallen transformer and downed power lines in Santa Rosa, Calif.
LOS ANGELES - PG&E purposefully shut off electricity to nearly 60,000 Northern California customers Sunday night, aiming to reduce wildfire risks from power lines during extreme winds. 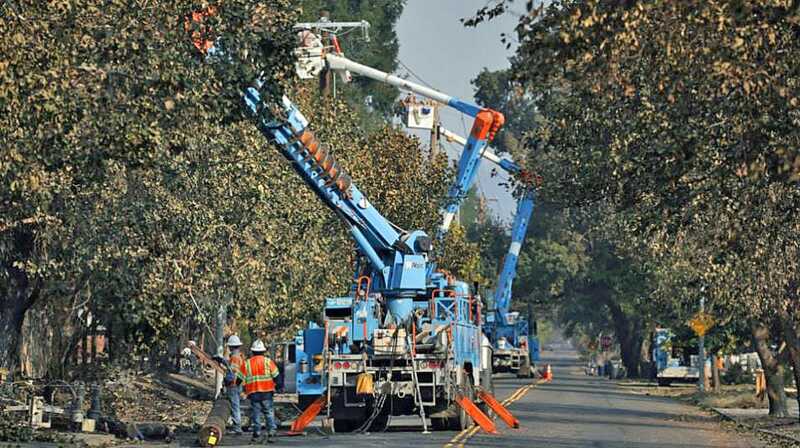 Pacific Gas and Electric planned to restore power to 70 percent of affected customers in the North Bay and Sierra Foothills late Monday night. As crews inspect lines for safety by helicopter, vehicles and on foot, the remainder will have power sometime Tuesday. While it was the first time the company shut off power for public safety, PG&E announced its criteria and procedures for such an event in June, said spokesperson Paul Doherty. After wildfires devastated Northern California's wine country last October, he added, PG&E developed its community wildfire safety program division to make power grids and communities more resilient. Two sagging PG&E power lines caused one of those wildfires during heavy winds, killing four people and injuring a firefighter, the California Department of Forestry and Fire Protection determined earlier this month. Trees or tree branches hitting PG&E power lines started another four wildfires in October 2017. Altogether, the power company has been blamed for igniting 13 wildfires last year. "We're adapting our electric system our operating practices to improve safety and reliability," Doherty said of the safety program. "That's really the bottom line for us." Turning off power to so many customers was a "last resort given the extreme fire danger conditions these communities are experiencing," Pat Hogan, senior vice president of electric operations, said in a statement. Conditions that led the company to shut off power included the National Weather Service's red flag fire warnings, humidity levels, sustained winds, temperature, dry fuel and local terrain, Doherty said. The company de-energized more than 78 miles of transmission lines and more than 2,150 miles of distribution power lines Sunday night. Many schools in the area were closed Monday because of the planned power outage. Late Saturday and early Sunday, PG&E warned 97,000 customers in 12 counties that the shut off might go into effect. Through automated calls, texts and emails, the company encouraged customers to have drinking water, canned food, flashlights, prescriptions and baby supplies on hand. Power was also turned off in Southern California on Monday. San Diego Gas & Electric turned off service to about 360 customers near Cleveland National Forest, where multiple fires have scorched large swaths of land in recent years. SDG&E has pre-emptively shut off power to customers in the past, most recently in December when 14,000 customers went without power. Southern California Edison, the primary electric provider across Southern California — including Los Angeles — has a similar power shutoff program. As of Monday night, SCE had yet to turn off power in any of its service areas, a spokesperson told USA TODAY.